f.89v Sketch map of part of Sind. bl.uk > Online Gallery Home	> Online exhibitions	> Asia, Pacific and Africa Collections	> f.89v Sketch map of part of Sind. 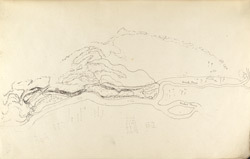 Pen and ink sketch map of part of Sind by George Boyd (1800-1850), dated between 1821 and 1844. This is one of 95 drawings (90 folios), chiefly of landscapes and monuments in the Deccan, West India and Afghanistan made duirng this period. Boyd served in the Bombay Infantry from 1820 to 1850 and was mainly employed in survey work. From 1822 to 1831 he was in the Deccan and Satara; in 1835 he was on survey in Kathiawar; and in 1839 he was making road surveys in Sind. He was mentioned in despatches during the war in Afghanistan in 1840 and in 1842 he worked on a survey between Quetta and Kalat. The Province of Sind is located in Pakistan on the Lower Indus plain between Baluchistan and India. The name Sind is derived from the Sanskrit word Sindhu meaning ‘the divider’ as the River Indus divides the province in two. At 3,200 kilometres (2,000 miles) the Indus is the third longest river in Asia after the Yangzi and Yellow Rivers. Rising in Tibet it passes through Ladakh in eastern Kashmir then enters Pakistan where it flows through some of the world’s deepest gorges before reaching the Punjab and Sind, where it can be as wide as 30km (20 miles) before it discharges into the Arabian Sea. The Indus is exceptionally important to life in Pakistan. It is liable to flooding and has changed its course many times over the centuries. The deserts tracts of Sind host many cities that were once flourishing riverside centres before the river altered its course.